Jingoism aside, this summer has seen a real celebration of all things ‘Great Britain’. The world’s attention has been drawn to the celebration of our Queen’s 60th Anniversary, the Olympic Games and now, the Paralympic Games. 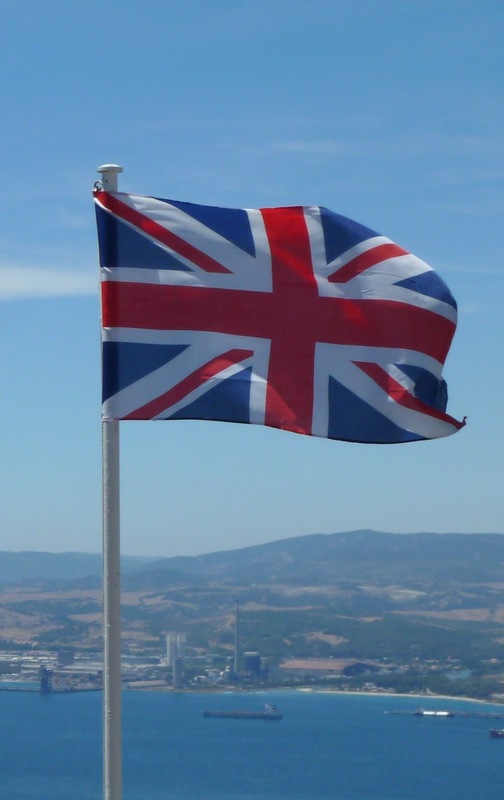 One of the strongest symbols of Great Britain is our flag – the Union Flag (I think we’re allowed to call it the Union Jack again – but can’t be sure), which has fluttered across the country and on television sets across the world for months now. It is a distinctive flag, often seen included as part of other country’s flags: e.g. Australia, New Zealand. 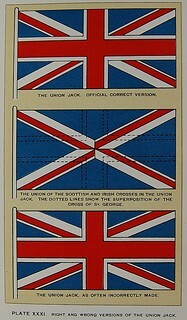 See http://www.woodlands-junior.kent.sch.uk/geography/unionjack7.html for a nice illustration and explanation of the ‘right way up’ and the ‘wrong way up’. How do people learn which way up is correct these days? When I was younger, I was in the (wolf!) cubs and (boy!) scouts, and we were taught that sort of thing. We were taught a lot of other ‘stuff’ too, much of it useless today, but quite a bit of the ‘stuff’ has been life forming. The flag issue was just one of those things that stuck. I don’t remember being taught about the flag (as such) at school, but we were sort of just expected to know. Many of my teachers were ex-service personnel, it being the time of compulsory national service, so perhaps they just thought we would know. Sharon, who spent her formative years at school in America, hadn’t a clue there was a right way and a wrong way. I’m sure that many young people these days don’t know either. But there is a wrong way; and it’s jarring to see it hoisted, printed, hung or displayed wrongly. The various websites I’ve seen (more than those listed) suggest that besides being disrespectful, hanging the flag upside down is illegal. I wouldn’t know about that, there are many more issues far more worthy of prosecution, but … well, I’m just saying. I realise that social rules applying to the public use of mobile phones are slowly evolving; yet I believe that there are a still few aspects of such use that need sorting out sooner rather than later. We’ve all heard the guy (or gal?) on the train conducting his business at mega dB and driving everyone to distraction; he needs sorting out the soonest. I think that some people just go into a bubble when their phone rings, a bubble that excludes everyone and everything around them, something they would probably never do on any other occasion. I once heard a former boss of mine conduct job contract negotiations on her mobile, to the rapt attention of everyone in the carriage. Nevertheless, I have also begun to notice that some mobile phone users now move out of the main carriage to make their calls. Also, (and I count myself in both of these groups) I notice that some call recipients quietly move to the doorway nowadays, before continuing their conversation. I’ve also noted increased use of the simple “I’m on a train, can I call you back?“ I suppose that’s progress. Many of these calls are essential – I realise and concur with that. I’ve very often told prospective customers and clients to call me while I’m on the train, because a) the time I’m on the train suits them and b) because when I get to my destination I’ll be doing something else and the phone will be off*. However, like many others I now take or make those calls away from fellow passengers. It’s not that the call is particularly sensitive or secret, it’s mainly because I (we?) realise that it’s an annoyance to other passengers. So we just need to convince ‘that guy’! How many of us use our mobile phones to photograph things as we go about our daily business? I do! I also photograph attractive dishes when eating out no matter whether it’s a £75 per head jobbie or just a particularly attractive sandwich I’ve bought for £1.99. I may even have made the food myself! I did once ask myself: ‘does this annoy fellow diners?’ and at one time, it probably did, but I think it’s less annoying and more prevalent now than it was a few years ago. Imagine all of the different groups sat along a Wagamama table taking mobile shots of their food as it arrives. I’ve seen it happen. But what about those folks who insist on leaving their phone turned on in the restaurant, or in a meeting [see below], or in the cinema? What sort of selfishness does that display? After all it doesn’t take much effort (or thought) to switch over to silent-mode. We all make mistakes, but 99 times out of a hundred, *I will turn my phone to silent or ‘off’ depending on the circumstance. I don’t want to disturb my fellow diners, or colleagues in a meeting by interrupting proceedings and I certainly don’t want disturbing in the cinema. “There are [..] as yet no agreed rules of etiquette on the use of mobile phones during business meetings.” page 85. Will more people start turning off/silent from now on? Surely this is the most annoying thing that people do with their mobile phones? Talking on the phone whilst driving is both dangerous and illegal. I used to do it – I don’t anymore. I use a hands free kit when driving but when possible will pull over if I receive a call because I know it can be distracting. I’ve seen so many people holding their phones to their ear whilst driving that it drives (sorry) me to distraction. 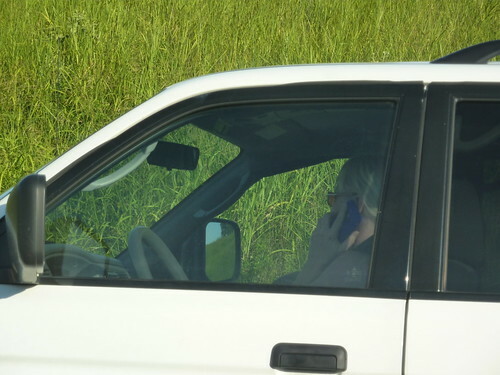 These people are no longer fully aware of what’s going on around them – I’ve seen drivers drift over to the wrong side of the road, or slow down almost to a stop (in moving traffic) and as I pass their car, a closer look sees them ‘on the phone’. How long will it be before we all adhere to mutually accepted social rules that define mobile phone use in practice?